Adobe Photoshop; is a powerful graphics software. The variety of options and features in Photoshop allows us to create different and unique designs. One of the features of Photoshop is that in it interesting typography can be created by overlapping text which can be later used in different posters and ads. 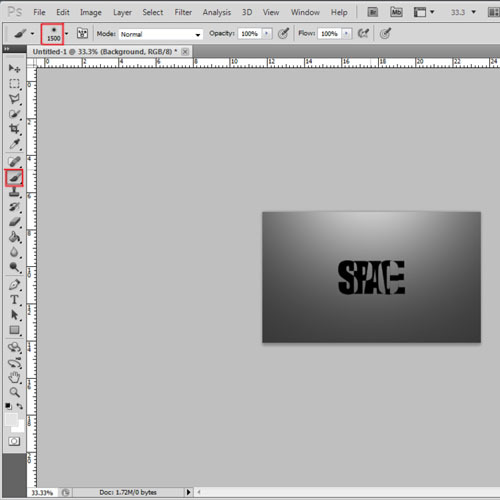 In this Photoshop tutorial, you will learn a simple way of how to overlap the text in Photoshop and then add some effects to it. 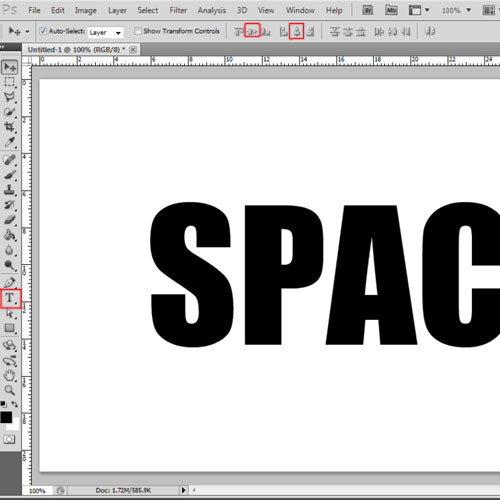 Follow the steps to learn how to make overlapping text in Adobe Photoshop. 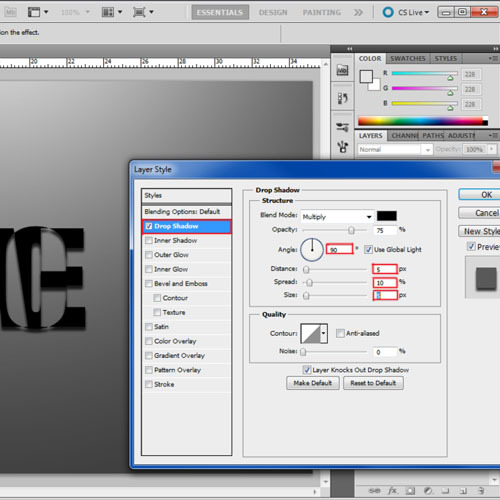 First of all, pick up the “type tool”, type in your text and align it to the center of the canvas. Here, we would be using “Impact” for the font. Now convert the text layer into a shape layer, pick up the “path selection tool”, select the complete text and click on the “Exclude overlapping shape areas” option. Now all you have to do is select each letter and overlap them on the previous alphabet. 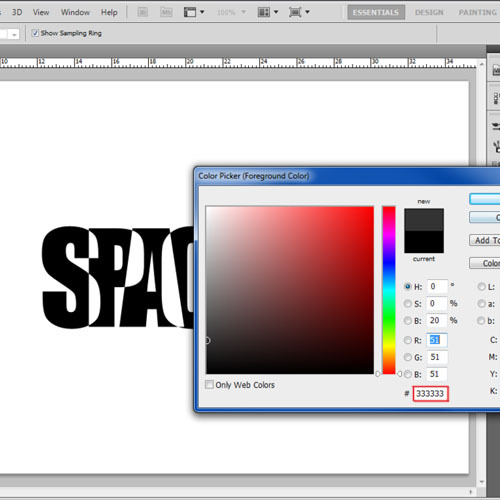 Once done, align the text to the center of the canvas and select the background layer. Once overlapping the text is done, we will add color to the background. Choose “333333” for the color fill and apply it on the layer. Now choose “e4e4e4” for the color fill, pick up the brush tool, use a soft brush, increase the size of the brush till it covers the whole canvas and apply it on the canvas. 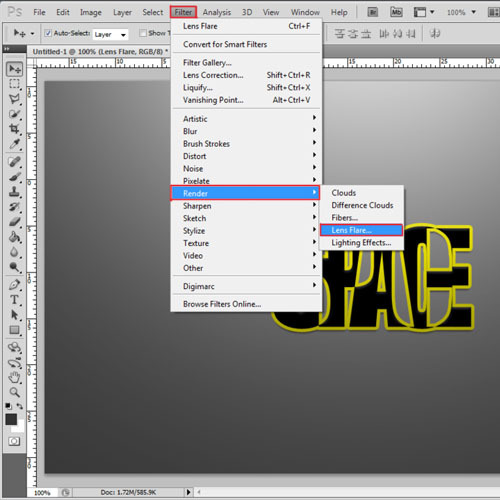 Now select the shape layer and open up the Layer Style options. Move over the “Inner Shadow” tab, set the angle to “90 degrees”, distance to “5 pixels”, spread to “10 percent” and size to “5 pixels”. Next, move over to the Bevel and Emboss tab and set the depth to “10 percent”. Last of all, move over to the “stroke” tab, choose “5 pixels” for your stroke and choose “e1d909” for the color fill. Change the Blend Mode of the stroke to “Overlay”. 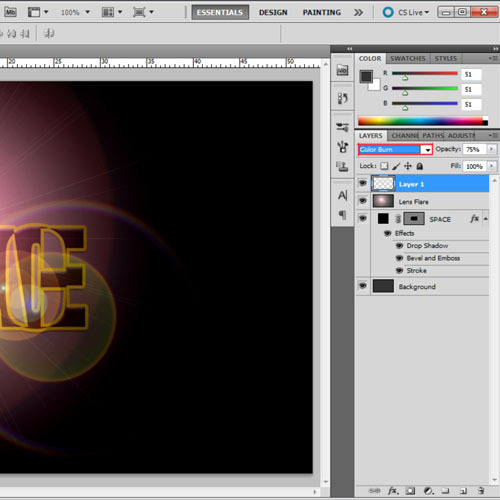 Now duplicate the background layer and name it “Lens Flare”. 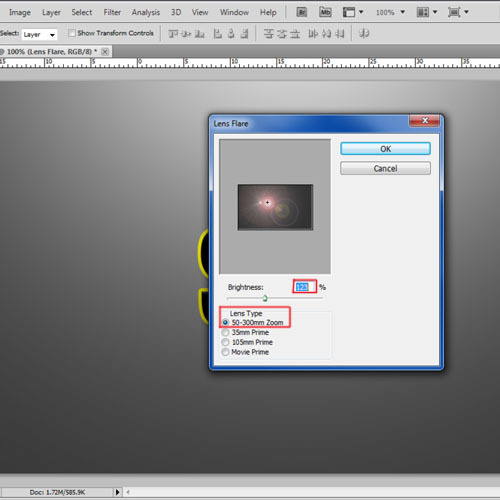 Once done, open up the “Filter” menu, move over to “Render” and click on the “Lens Flare” option. Choose “130%” for the brightness and “50-300mm” zoom for the lens type. Once done, move the lens flare layer right at the top and change the Blend Mode of the layer to “Linear Light”. Now select the layer where we applied the soft brush and move it right at the top. Change the blend mode of this layer to “Color Burn”. 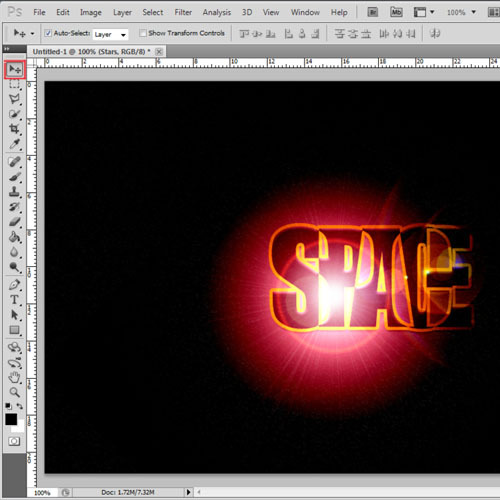 Next in this Photoshop tutorial, create a new layer and position it above the Lens Flare layer. 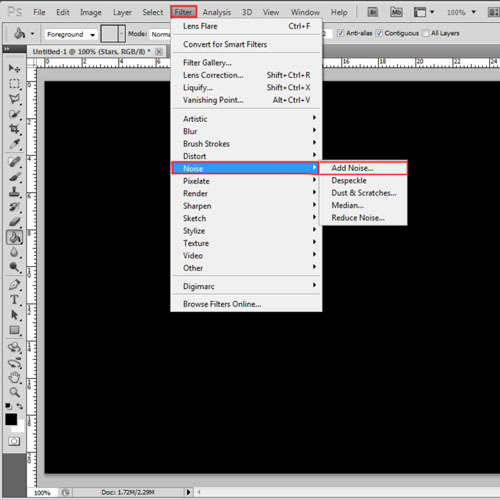 Fill the layer with black color, open up the “filter” menu, move over to “noise” and choose the “Add Noise” option. Use 10 percent for the amount; choose Gaussian and monochromatic distribution for the filter. 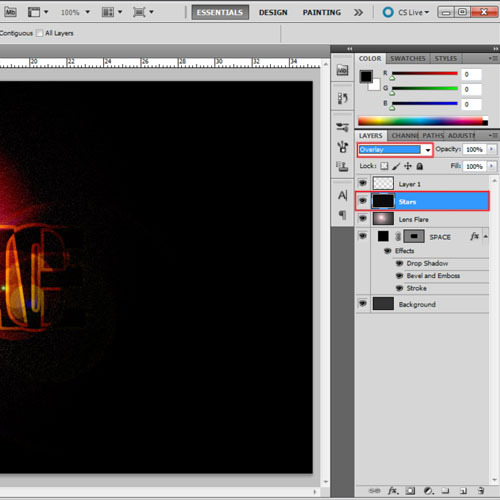 Now change the Blend mode of this layer to “Overlay” and select the Lens Flare Layer. 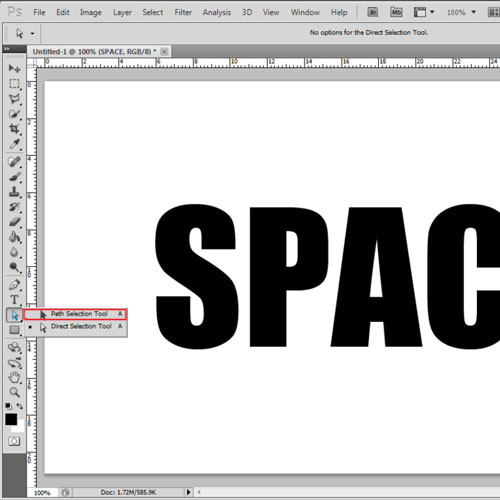 Use the “transform tool” to move or tilt the flare so that it covers up the whole text. If the background layers are a little visible, simply pick up the paint bucket tool, select the layer where we added the noise filter and paint the layer with black color. 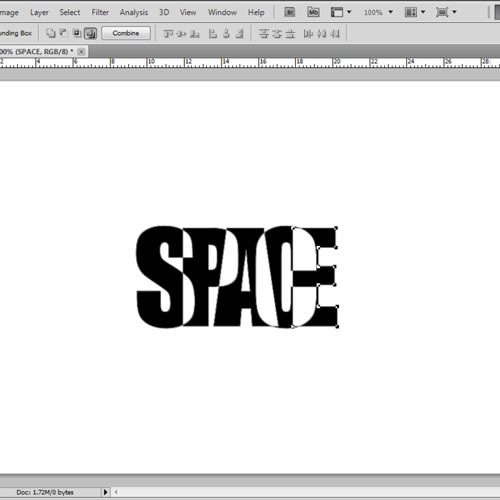 Your overlapping text with effects added is now ready to be further used for designing purposes.